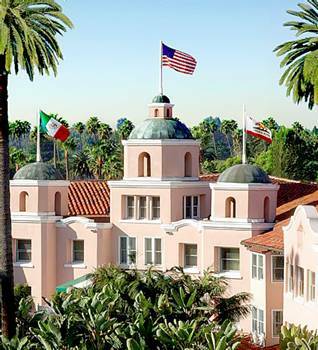 The Pink Palace in Beverly Hills is celebrating its 100th anniversary. Walking into the lobby, one notices a life-size artifact gallery filled with photos of the hotel and their celebrity guests that have graced its grounds. In 1906, Burton Green from the Rodeo Land and Water Company developed acres of lima bean fields, that were once owned by the Mexican Government. Since the land was located at the base of rolling hills, Green renamed the area Beverly Hills, after his home in Beverly Farms, Massachusetts. Margaret Anderson and her son Stanley S. Anderson were commissioned to build a hotel halfway between Los Angeles and the Pacific Ocean on May 12, 1912. Since Anderson had been the manager of the Hollywood Hotel, she hired Pasadena architect Elmer Grey to design the new hotel. He had designed the Huntington Library and the Pasadena Playhouse. In 1923, Will Rogers is sworn in as the mayor of Beverly Hills on the grounds of the Beverly Hills hotel. This location became Rogers and his friends watering hole after polo matches. In 1930, the hotel closed due to the depression. The bungalows were leased out to individuals until a bank reopened the hotel in 1932. In 1941, under new ownership, the restaurant inside the hotel, El Jardin, is renamed The Polo Lounge, in honor of Will Rogers, Darryl Zanuck, Tommy Hitchcock and Neil McCarthy. The hotel is offering fun festivities for visitors this year. Vintage photos of Sophia Loren, Clark Gable and the hotel built in 1912, grace the menu covers. A group of friends and I recently had lunch in the Polo Lounge. We were excited to sit next to comedian Tom Arnold, (once married to Roseanne Barr). Astronaut Buzz Aldrin and actress/ comedian Amy Poehler (Saturday Night Live) sat outside on the lovely garden patio at separate tables. Aldrin’s ex-wife, Lois Driggs Cannon was dining inside the restaurant with a friend. An interesting moment happened when Buzz, carrying a book with a rocket ship on the back of the cover, walked by Cannon’s table. Buzz Aldrin looked fit and spry for a man born in 1930. What I like about the Polo Lounge is the impeccable service. Servers Felix and Pepe have worked at the Polo Lounge for years and have waited on many celebrities. One of their favorites was Princess Diana sitting in the back garden patio. While looking over the menu, one of the most gorgeous and talented blonde piano players, Oksana, entertains guests. We decided to order two items that have been on the menu since day one, the McCarthy salad and Tortilla soup. The salad was named after Neil McCarthy, who frequented the restaurant after casual polo games. When the actor/polo player got hurt after a game, his mouth was sore. The Chef in the kitchen finely chopped all the ingredients in the salad he ordered. It was a hit with the actor and his friends. Today, this wonderful chopped salad is still one of the most popular items on the menu. For Beverly Hills buffs, Robert Anderson, the great-grandson of the hotel’s original owner, Margaret Anderson, is launching his book ”The Beverly Hills Hotel and Bungalows – The First 100 Years,” this month. As the official historian of the Beverly Hills Hotel, he has exclusive images of many dignitaries and celebrities, historical facts and documents that are featured on each page. Many of the photos have never-been-seen-before of celebrated guests relaxing and enjoying the grand hotel. His book is available at the hotel’s Logo shop and on the website. Each guest room in the hotel will have a book on display. To learn about other special events at the hotel this year, go to www.thebeverlyhillshotel.com 9641 Sunset Blvd. (310)887-2777. Article published in the May 2012 issue of Not Born Yesterday.